StarTek – Will It Survive? Full disclosure before the article – I was once a StarTek employee for eight years. I definitely enjoyed my time working for the company – until the seams began falling apart. This is simply my opinion of the company and where I see it trending. StarTek is a dying company. Over the past couple of years, the company has continued to close several call centers in both the United States and Canada. While they are opening locations overseas, they are continuing to see a loss in market share towards other competitors. I believe the company has less than ten years left to survive at the current rate of decline – and maybe less. The company has always had an issue with hiring well-talented management officials. Look at the flop of the previous Sales Vice President that didn’t bring in an abundance of new business. At a time when they need talented, tenured individuals that understand the business, they are laying them off and eliminating their positions so they can take jobs overseas. The company has already saved considerable cost by shipping most of the support positions to the offshore locations – including resource planning and management, accounts payable, training, benefits, project management, and many other departments. However, the company is also paying the price. Although the cost for the worker overseas is less, production and efficiency is highly reduced as well. There have been several instances where invoices are not paid on time and management has been required to put the fire to the Filipinos to get things done. Employees working offshore do not pay as close attention to detail nor follow company policies and procedures. It has also been rumored that the loss of business StarTek just suffered – that saw the closure of two additional US sites – stemmed from employee relation issues and unethical behavior from one of the Philippine locations. Much like the American consumer, StarTek fails to realize that Americans despise talking in foreign countries. Could you imagine how a potential customer would react if they were called back by a sales person that has an accent and is noticably from another country? StarTek doesn’t care – they think they are saving money by doing so – when the fact is they are potentially losing leads, good potential employees, and customers because of it. With all this being said, is the continuous offshoring helping – or hurting the company? Another round of cost cutting is currently taking place along with downsizing. The CTO has left although – is being maintained for the month of June. A few other high-level IT management have left within the past six months. It also has been reported that the IT security team is also cut down to nothing. This alone is going to result in the loss of additional business because attempting to maintain or obtain their current security certifications will be more difficult. Some of these are requirements for clients and so if the company cannot maintain the level they possess, they stand to lose additional clients. The backbone of StarTek is Information Technology. The company relies on technology to operate. However, the technology budget has been shrunk to almost nothing and all their staff is overworked. With the additional cuts, this means additional duties and tasks have to be assigned to the already smaller department. They cannot even get an approval to purchase needed server upgrades or materials. They have also cancelled many maintenance contracts they once had with vendors providing support. The infrastructure of the company is about ready to bust at the seams. All in all, the company continues to cut jobs and move more overseas. The current CEO is a southern idealist that micro-manages all aspects of the company. However, many also have theorized that the CEO himself is attempting to dismantle the company so a competitor can purchase it on the cheap – or completely shut down the company overall. Realize that the CEO originally came from Sitel – and many of the individuals he has hired on have also come from Sitel. So, is Sitel pulling the strings of StarTek with the source of power they now have over the company? Maybe the CEO himself should take a pay cut since he isn’t turning the company around. Or, maybe the board of directors should outsource the CEO job – along with finance and other overpaid positions overseas. That will reduce cost considerably. The Board of Directors need to be awakened and get an idea as to what Chad and other executive management have done to this company. I took several pictures over the past week – and some last night as well. The weather – again – has been extremely hot. 95 degrees or so over the past few days and very dry. Humidity 45 – 60% is low for Illinois as it is typically 75% or higher throughout summer. We did get a good rainfall at the beginning of the week to soak things down – and refill the rain barrels. That was certainly welcome – but we still are under half of the normal amount of rainfall for this time of year. Moving on to the garden. All but three of the broccoli plants have now been cut down. Basically the Green Goliath broccoli were all harvested. You can see that I picked some of the broccoli a bit late – as the flowers were already opening up. 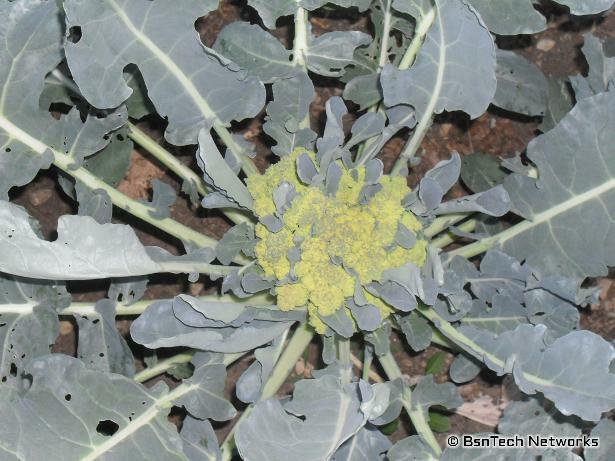 Here is a photo of one of the Green Goliath broccoli plants. These plants were put in the side garden this year (as they were last year), and there is just not enough sunlight to make them happy. They are going to have to probably go up into the flower bed next year. Last year, some were planted in the flower bed and the heads on them were huge. Full sunlight for broccoli makes a big difference (well, and soil composition too). 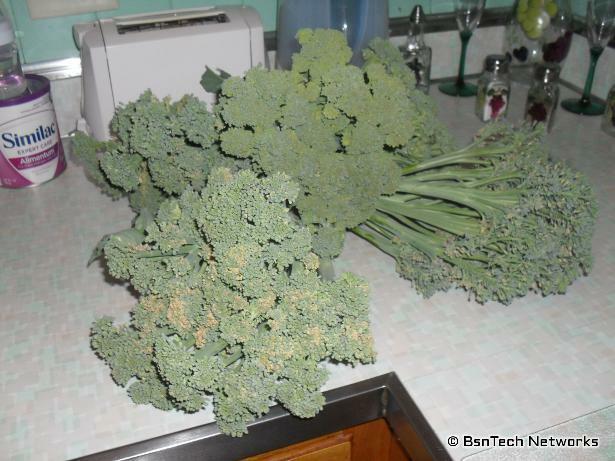 Now, compare the Green Goliath broccoli to a picture of the Premium Crop broccoli. 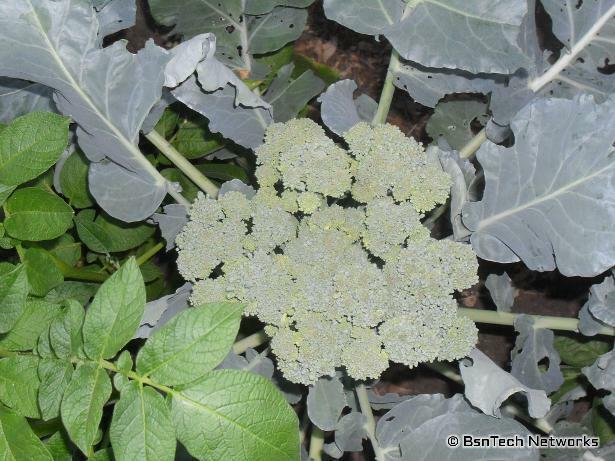 The coloring of the broccoli is different – and with the Premium Crop broccoli, ther eseems to be some leaves that are actually tangled within the head of the broccoli. Not so pretty. 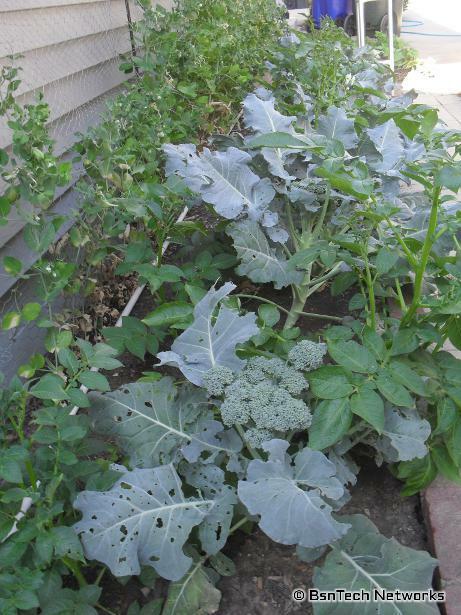 I have been growing Green Goliath broccoli for several years – probably over five years now. The seed was bought at least five or six years ago, and with keeping all of the seeds in a ziplock bag in the freezer, the seeds are still viable and germination is still fairly good. I prefer Green Goliath over Premium Crop. 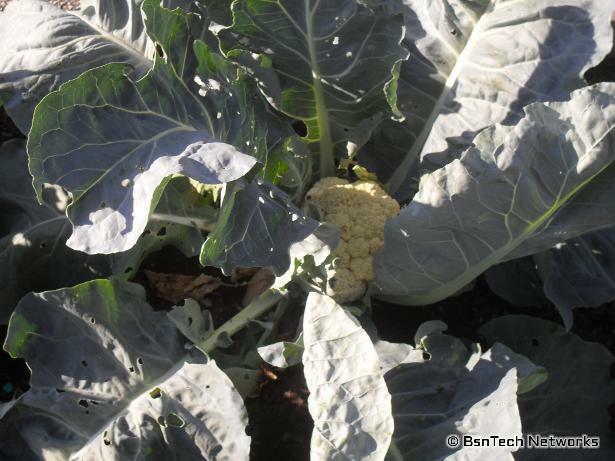 It just seems that Green Goliath broccoli produces more – and doesn’t have those leaves in it like the above Premium Crop broccoli picture. Alright, moving on to Snow Crown Cauliflower. Four of them were located down in the flower bed that got full sun – and they did very well. 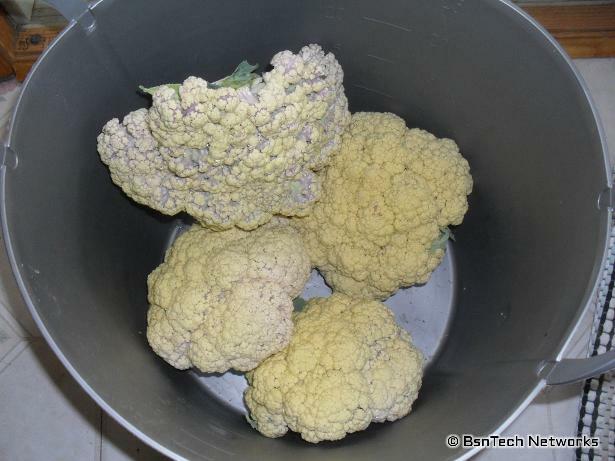 My first try at cauliflower was a disaster using the Snowball X variety – but the Snow Crown cauliflower variety impresses me. Even through drought conditions and intense heat, every single plant has always produced a good-sized curd. I just had some of the cauliflower last night as a treat – dipped on some ranch dressing. The rest went into the freezer so we can use it down the road. Movnig on to Cascadia peas. The peas are all dying off now becuase of the heat. We didn’t get nearly as many peas this year as we did last year. I didn’t take any other pictures of them, but here is one tkaen right after they were harvested on the 18th. I like the plump, edible pods. 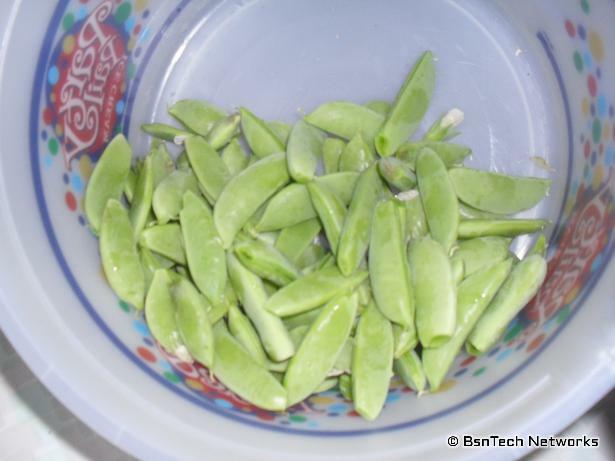 I’ve seen other varieties where you either can’t eat the pods – or you can’t allow the peas to get large. Cascadia snap peas is the variety of choice for me and it does fairly well. The sweet taste of them makes for a nice treat in salads or even as a side with it’s crunchy texture. These other photos were just randomly taken last night while in the garden. I left the strawberries uncovered this year in the strawberry pyramids. The deer have obliterated them – and there is nothing left but stems. The tri-star strawberries look deathy ill as well. I’m not sure yet what to do about this issue – because we just were not happy with the size of the tri-star strawberries anyways. They were quite small and didn’t meet our expectations. They are an everbearing strawberry though – meaning that they produce continuously through the year. Well, that didn’t happy either. So, I am OK with the deer eating them down. 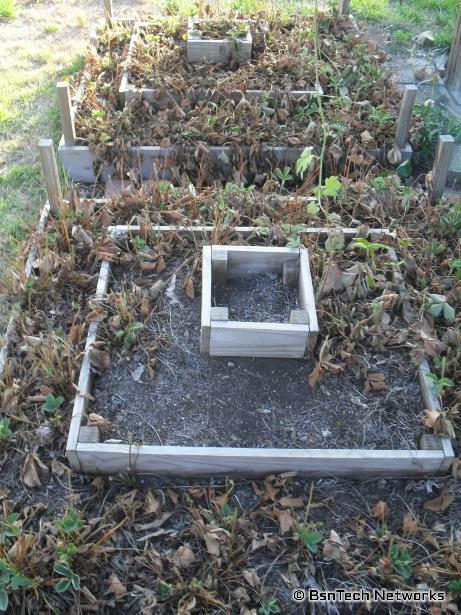 The strawberry beds will most likely be gutted and new strawberries planted next spring (if time allows for that!). The front garden is growing very well. Finally after planting Honey Treat corn about four or five different times, the corn area is full. Although the plants that sprouted first are overtaking those that were planted last, they do all appear to be slowly growing. Those planted first already have the tassels beginning to emerge – and have one and even two side shoots that look to be ready to produce an extra ear of corn. 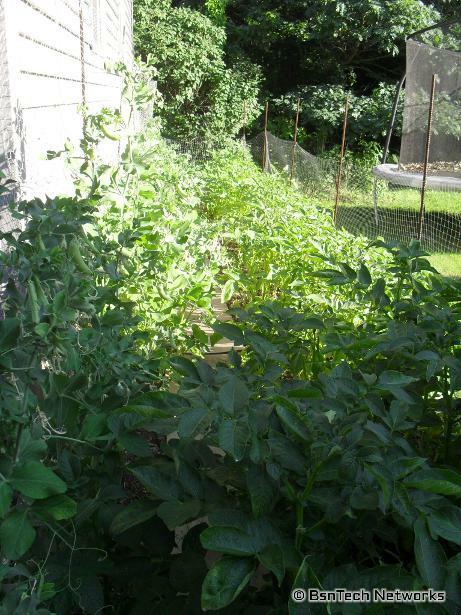 In the front you will see the California Wonder peppers to the right and also the tomatoes on the left. 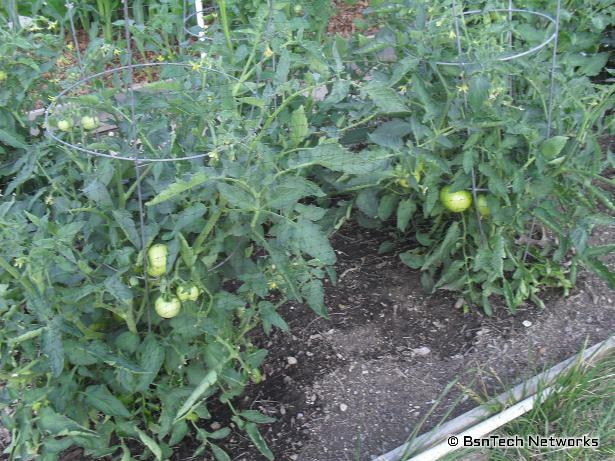 The tomato plants have a huge amount of blooms on them – so we’ll see how the tomato crop is this year. And lastly to end the entry, I was quite surprised with the grapes. The grapes have really grown everywhere this year – and I am surprised just how fast they came back. We had a late freeze that killed the grapes earlier in the year (didn’t affect anything on the ground). 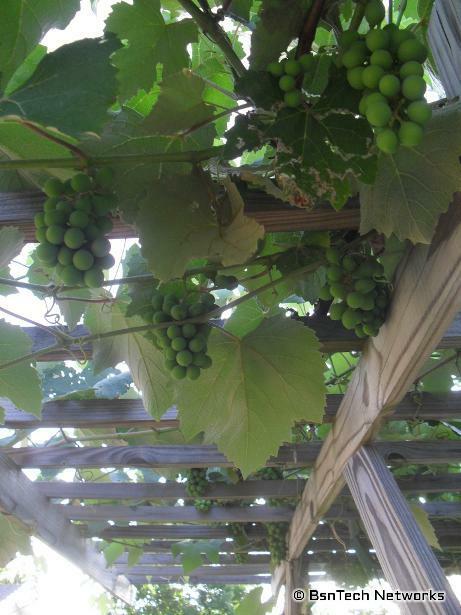 But, under the grape arbor, the vines are loaded with grapes. The question will be if they are edible though and if we can get to them before the birds do. I tried one of the grapes a few years ago and it wasn’t pleasant – and they had seeds in them. When I put my order in for them online, I specifically got seedless grapes – but apparently the business that sent them to us didn’t even send us the right variety (and on top of that, two of the four were dead). Wow, two posts in a month! Well, this one is a pretty simple post. I see a lot of questions on message boards asking – what is bolting lettuce – or what does bolting lettuce look like? Well yesterday morning, I went out and picked a huge amount of lettuce. Most of it already had some brown spots in it and wasn’t worth keeping – but I did get a large container full of lettuce that we kept. Filled four one-gallon freezer bags. Unfortunately, the lettuce is bitter now because of the hot temperatures. Anytime lettuce begins to bolt, it will cause the lettuce to be bitter. However, there isn’t any sense in throwing away the whole thing! The key is – cutting out the stems. The main stem in the lettuce leaves are what contains the bitter tasting stuff. So when cutting up the lettuce, just discard the stems and the rest of the leaf is just fine. Otherwise, it certainly would be a shame – because we got about a 5-week supply of lettuce. Now with this last batch, that should last another three weeks and push it up to an 8-week supply. After the lettuce was all picked, this makes for a perfect view of the lettuce plants that are bolting. 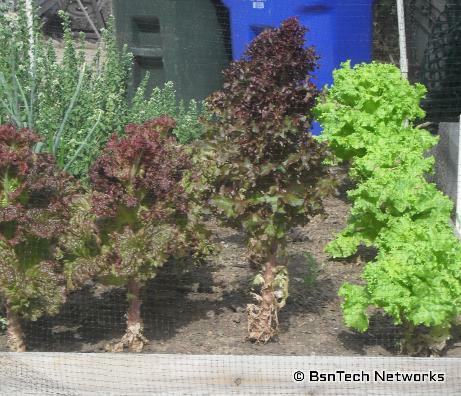 Notice the New Red Fire lettuce – the two on the left. Then there is the Red Salad Bowl lettuce just in front of the blue container in the background, followed by the row of Simpson Elite on the right side. You can really see how the New Red Fire and the Red Salad Bowl lettuce has bolted. This still isn’t the greated picture, but the lettuce is at least a foot tall (or higher). They look like miniature trees after I have removed the bottom leaves. 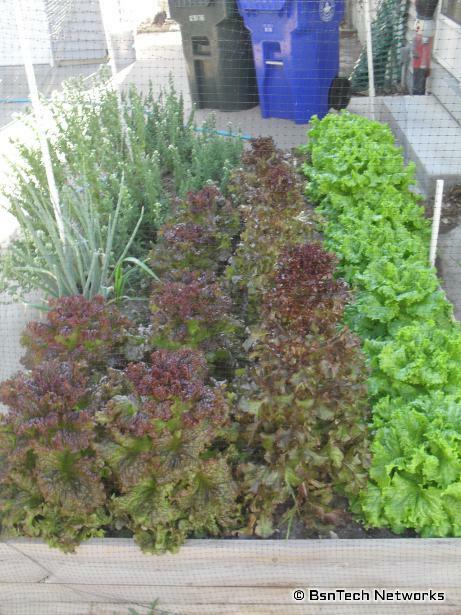 I’m not sure if we will get any more lettuce since the plants have already been bolting for the past week – but I don’t want to pull all of them out just yet. We have experienced some very odd weather this year. However, I will have to say that for the past two years, we have not had any major storms like we typically have. We live in tornado alley – and therefore typically have the sirens go off a few times a year. But, the sirens never went off last year – nor this year thus far. The weather in Illinois is changing – at least the past two years have seen it as well. A few weeks ago, we actually had temperatures of approximately 97 degrees for a couple of days. Then a cold front moved through and the temperatures have now subsided to more normal temperatures for the past couple of weeks. But, we still are lacking rainfall. Illinois – or at least Central Illinois – has had less than half of the normal rainfall up to this point in the year. Not good. However, it is a good thing that I am somewhat prepared and have a 660 gallon rain barrel system behind the garage to store water to keep the garden hydrated. Moving on. It has been another three weeks or so from my last post – and things have certainly changed around the garden. It is getting harder to find time to take pictures, resize them, and then create a blog entry. Back on April 6th, we had our baby daughter – and she certainly does consume a lot of time. In addition, I also started a new job and it takes me longer to get to work. In addition, I was spoiled at the previous job by not having to take a lunch – so I worked a straight eight hours and went home. With the new job, I do need to work the full schedule – so I get home about an hour and a half later (because of driving time as well). 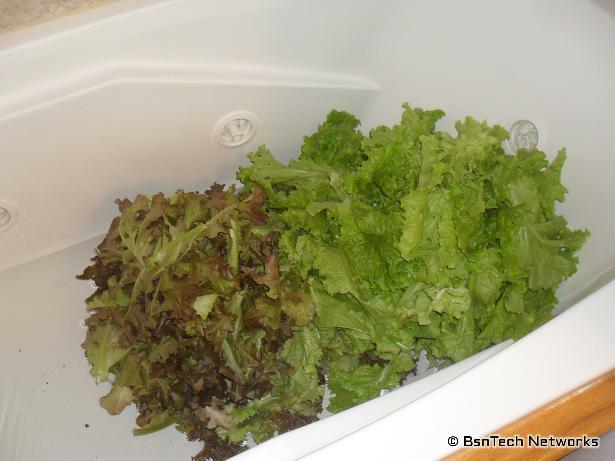 Starting off – here is some lettuce that was picked back on May 13th. We have only picked lettuce twice this year. This past batch took another six 1-gallon ziplock bags to fill. The harvest was so large that I decided it would be easier and faster to clean it in the bathtub. Now, the lettuce needs picked again – and I’ve just not done it. We gave two bags of lettuce to our neighbor – and it is now three weeks later and we still have a bag of lettuce in the fridge. Amazingly enough, it is holding well over the three weeks – but it is to the point where it almost needs tossed out now. The lettuce has begun to bolt – but there is a lot out to pick. I probably need to get out and pick it all tomorrow (Saturday). Over by the carrot area, the Sugarsnax carrots are doing well. I don’t know how many died off due to the weather, but it does look like it is a full load for the year. Due to lack of time this year (well, and the fact that some things we just didn’t eat), I didn’t put out any watermelon or cucumbers this year. Last year, we certainly had a good amount of watermelon – but we didn’t eat it very often. It was full of seeds – and when you have to constantly pick seeds out of watermelon, it makes you not interested in eating it. I did choose a seedy variety though because it was not a hybrid. I might try a seedless hybrid at some point – but that does mean continuing to purchase seeds each time we need to plant. The cucumbers – well, I kind of forgot about them. I’ve always put out about five or six plants – and end up with more cucumbers than we can eat. 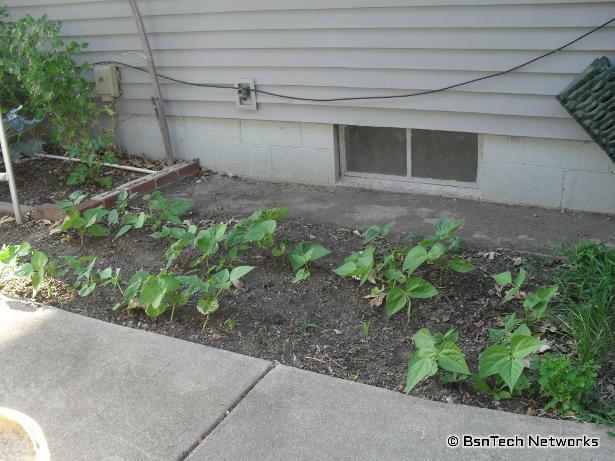 So, in place of the watermelon patch this year, I planted some green beans – because there isn’t a lot of space to plant green beans this year. Behind the green beans, I sowed a row of sweet basil – because again, I forgot to put it out. Only three plants came up. Better than nothing I suppose. Over at the side garden, the Cascadia Snap Peas are doing OK and the broccoli is doing well. We have already picked two helpings of peas. The weather really has zapped the peas since it has been so hot – but it does look like there are a few blooms just starting to come on again. Maybe we can get one more picking of peas – because only about three pounds have been picked this year (compared to about 12+ pounds last year). The back garden is also doing good with the Kennebec potatoes. Unfortunately this year, I don’t have any leaves to mulch the potatoes – so I just hope that the potatoes stay under the ground. 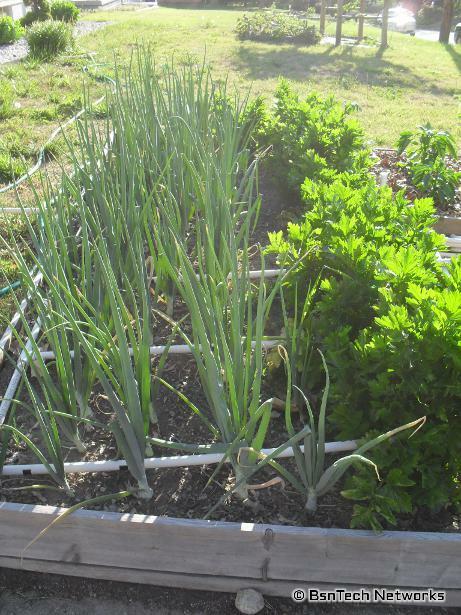 Moving to the front garden, the Copra onions and Ventura celery are doing well. 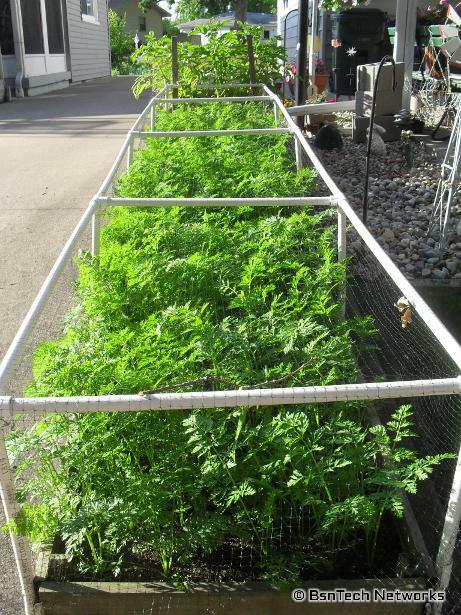 I do need to potentially cut one or two stalks of celery to start that process – since there is about 12 of them planted. 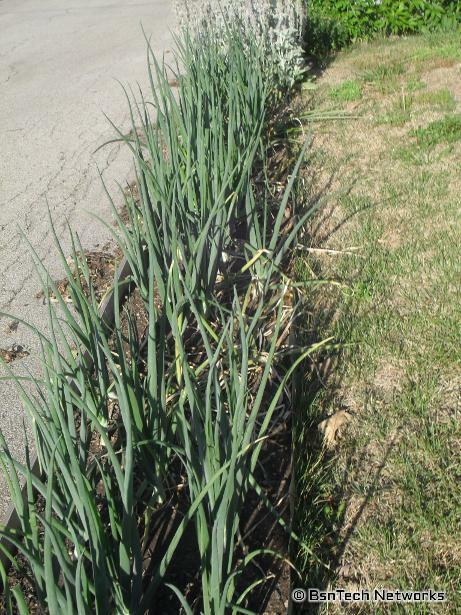 The onions down by the road in the flower bed are also doing well – maybe even better than those in the front raised bed. In addition, the four Snow Crown Cauliflower in the flower bed are doing well too. They all have a small cauliflower curd growing. Back to the main front garden, here is a total view of it. 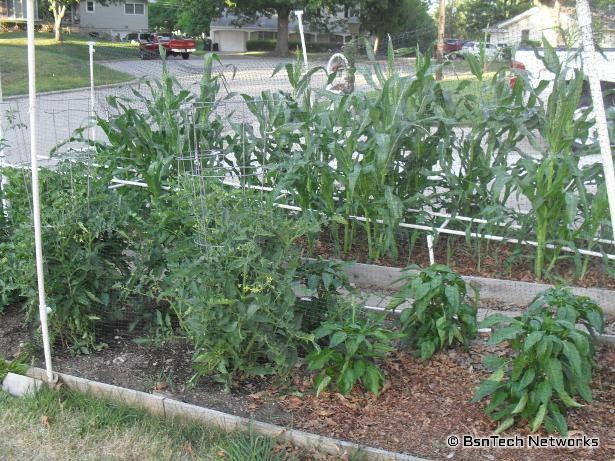 You can see the tomatoes and California Wonder peppers over on the left and the Honey Treat corn growing on the right. I have had a hard time with the corn this year. I ensured that it was planted after the ground temperatures warmed up – because sometimes I have planted it a bit early with poor germination. So, this year I waited a bit longer to plant it – thinking I would get better germination. Anything short of that! The first round, there was about 100 Honey Treat corn planted. Only about 20 came up. A second round of around 75 was planted. Only around 10 came up. Then I planted yet another round of 60 or so. Only four or five came up. I was getting a bit ticked – so I pulled out the germination containers that I use to start plants in. I planted another 144 last weekend and they are in the house. So far, about five have come up – still far short of what I need. 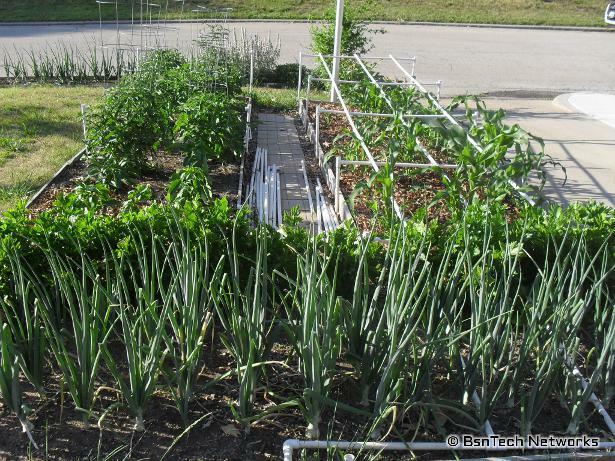 The front garden can support about 75 stalks of corn – spaced 8 inches apart in the row – and the rows spaced about 18 inches apart. And lastly, I decided to take a picture of the grape arbor and the strawberry pyramids. The strawberries completely need torn out – and a new variety tried. The Tri-Star strawberries did great the first year – then production was lost by about 50% – and this year, negligible. Maybe 8 ounces total for the year. We haven’t been very happy with the small size of the Tri-Star strawberries either – and certainly want to try something else that has a larger berry size. Well, that takes care of the garden update for this week. Hopefull I’ll post again before the end of the month!